As cast they probably won't clear, but there is enough material in the cover so that I can machine a flat on the back side of the driver's side cover to provide clearance. 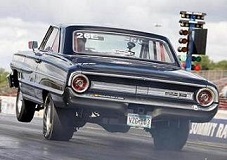 I've done this on a 66 Galaxie and they fit, I think 68 is about the same. Also, for 67-70 Mustangs and Cougars with power brakes, I can machine a relief in the top side of the cover for clearance to the master cylinder.